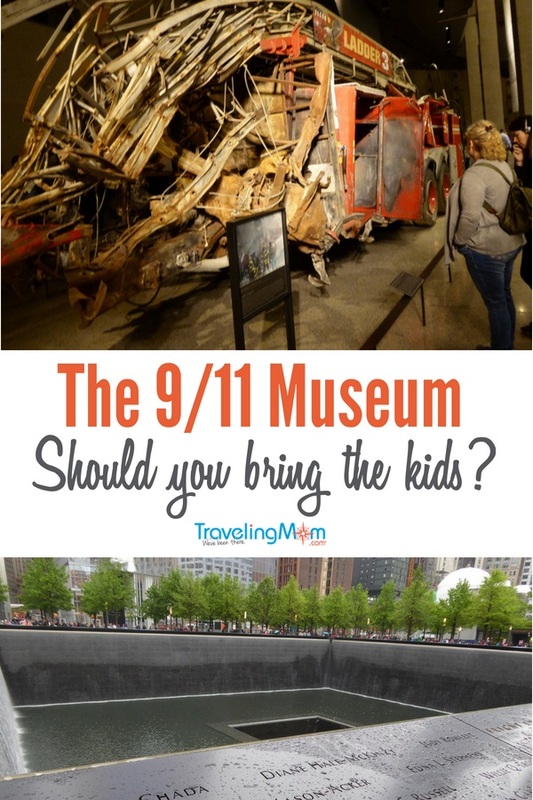 Home » Blog » Ask a Traveling Mom » Should you bring your kids to the 9/11 Memorial Museum in New York City? Visiting the National 9/11 Museum in New York City is a powerful experience. But is it a place you should take your kids? Suburban TravelingMom Jamie Bartosch visited the museum recently, and gives an honest take on whether she thinks it’s appropriate for kids. 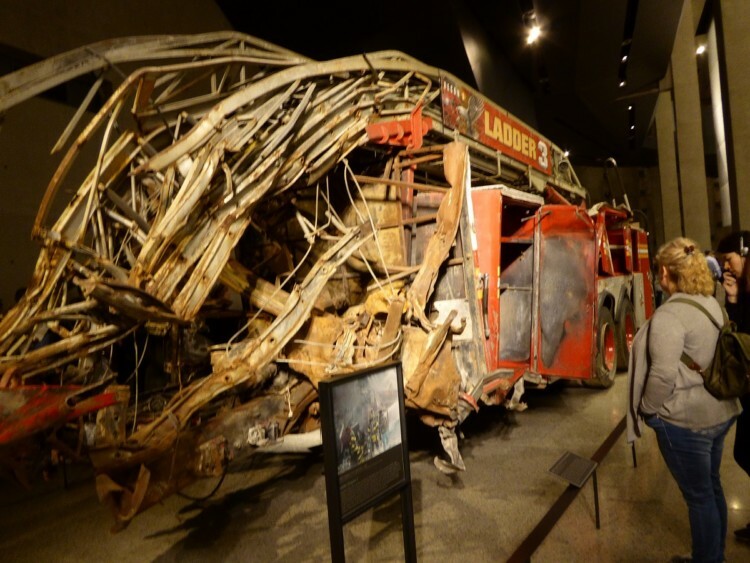 Should you take your kids to the 9/11 Museum in New York City? 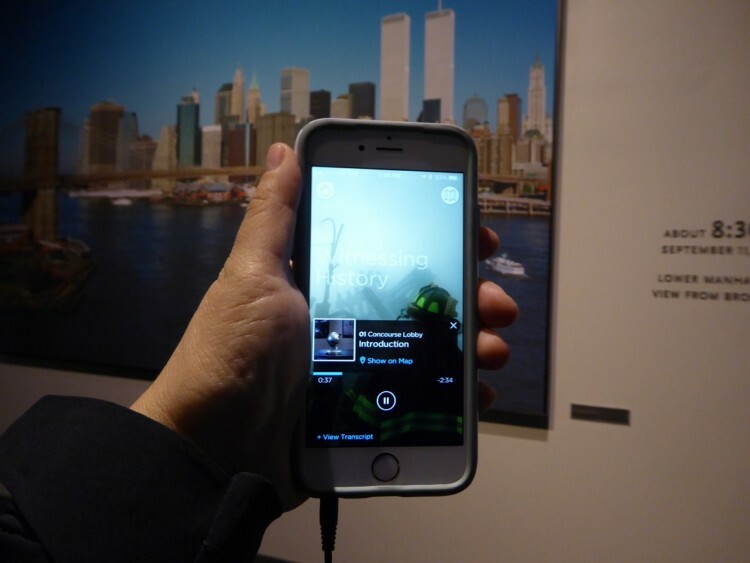 The National 9/11 Memorial and Museum is one of New York City’s most popular tourist attractions, and it’s a powerful, well-done commemoration of the 2001 terrorist attacks. A lot of parents wonder if it’s OK to bring their kids to the museum. My answer is NOT an automatic yes. Taking your kids to the 9/11 Museum is very similar to taking your child to a Holocaust or war museum. What they learn can scare them. So it’s not an easy choice for parents to make and it should depend on the child’s age, maturity and sensitivity. The museum’s website cautions that the historical part of the exhibition – the main part of the museum – may not be appropriate for kids under 10. It recommends adults “exercise discretion before entering” with children. I wholeheartedly agree. If you think the museum might be too much for your kids, a good alternative is to just visit the two enormous memorial fountains outside the museum. 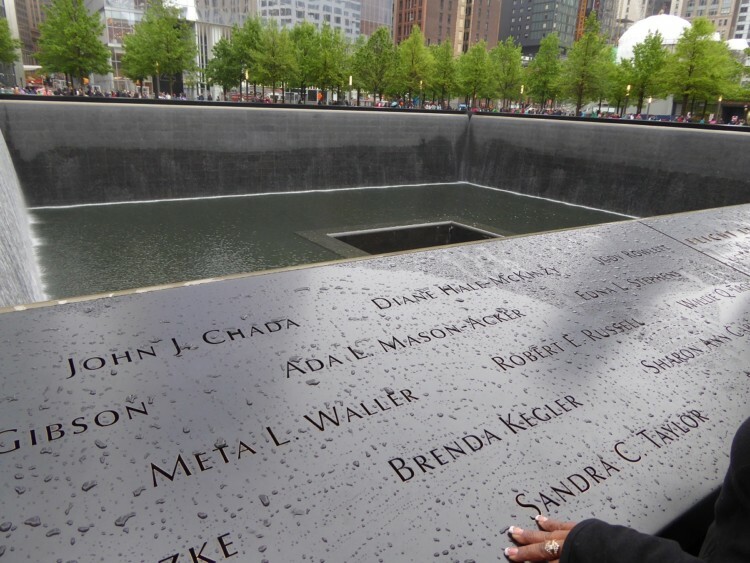 They outline the Twin Towers’ footprints, and are etched with the name of every person who died on 9/11. It’s not unusual to see a flower or an American flag laying next to one of them. That might be less traumatic than watching repeated footage of the planes striking the buildings. Is the 9/11 Museum appropriate for kids? 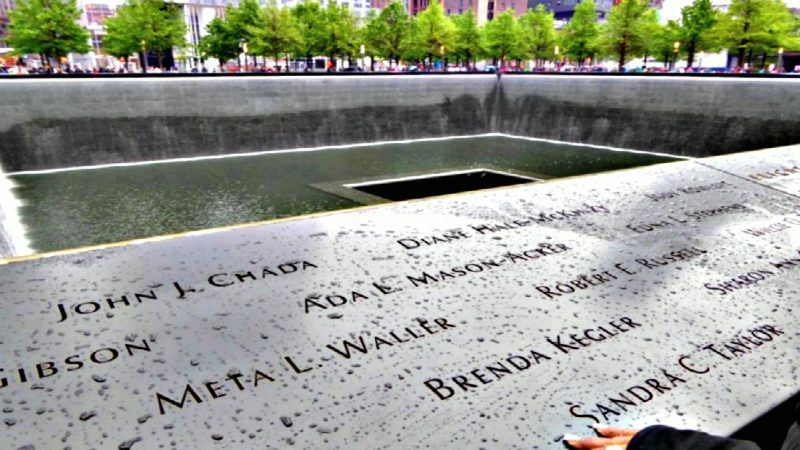 After visiting the 9/11 Museum in May, I can offer these suggestions to help you determine if it’s appropriate for your children. During my visit on a crowded Saturday afternoon, there were hardly any children in the crowd. The mood is very somber and quiet, almost funeral-like. People barely spoke. Even 17 years later, revisiting the horror of Sept. 11, 2001 is heavy stuff – and that’s coming from me, a former news reporter. All ages will be impacted by it, and feel brokenhearted for the families impacted by the tragedy. They were just regular people, going about their lives, on a sunny Tuesday morning in September. Here are reasons I’d offer on why, and why not, to take your children to the 9/11 museum. It is tastefully done. Rather than exploit the sad human stories, which it could have easily done, the stories are told in an unsensational way. Is there video of the planes hitting the towers? Yes. Of the building imploding? Yes. Of the thousands of missing person flyers that appeared afterward? Yes. But there’s no gore. There are no sections dedicated to “the jumpers,” and no footage of victims’ families crying. Photos of the hijackers are in a low, hidden spot – a design feature I thought was fantastic. Tragedy is part of history. A visit to this museum is a history lesson. It will invoke good discussions which can be teaching moments for children. Explain to them that there are bad people in the world, but there are more good people. The museum includes plenty of displays talking about all of the goodness that happened in the aftermath. There are kid-appropriate tours available. Besides guided tours specifically for youth and families, the museum’s free app has a child-friendly tour. It’s narrated by a child, and explains in very simple terms what happened. It mentions that even though it made people very sad, it also pulled the country together in wonderful ways to help. You can read the transcript on the app in advance if you want. The children’s tour is minimized to a few displays, like the crushed fire truck, and “the last column,” a tribute-covered steel beam that was the last item removed from Ground Zero. It is upsetting for adults! So it can definitely upset and scare kids. I saw a boy, about 10 years old, who looked tearful and terrified. But I also saw teenagers paying close attention to the exhibits. It’s a long tour. By the time you wait in line, go through security, and go through the different exhibits, you’re probably looking at a minimum of 2 hours. It took us just over 3 hours. There are no interactive, kids’ museum-like features. It is a lot of glassed artifacts, short video clips that play on loops, and story boards to read. Again, it’s very well done. But this generation is programmed to be entertained at museums, and they might find this a bit unengaging. Is the 9/11 Museum worth it? My 12- and 15-year-old kids were not with me on this trip, but would I take them to this museum? Yes I would. It’s a horrible but important part of American history. And it carries with it so many important issues that are relatable to today’s world. While I do think it would upset them, I think it’d prompt some meaningful, important conversations and teaching moments. Would I take my 8- and 10-year-old nephews? I would not. 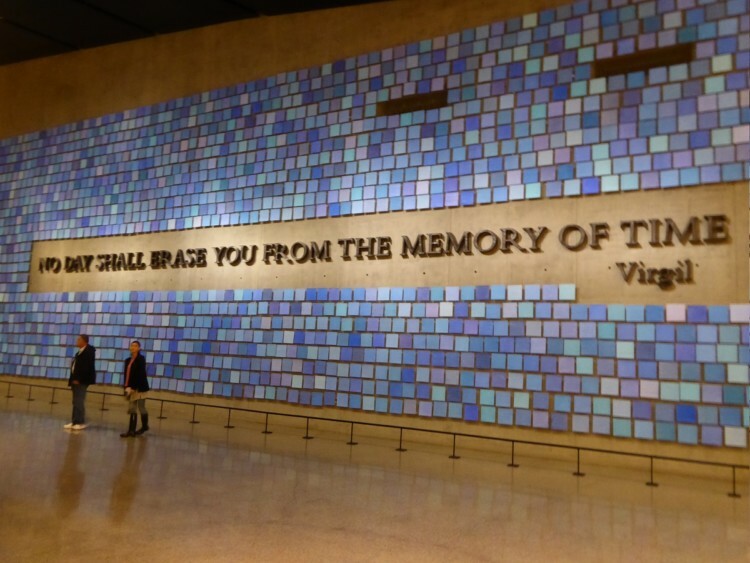 One of the lessons I liked at the museum was the wall-sized quote from Virgil near the entrance: “No day shall erase you from the memory of time.” It’s message can be applied to any personal tragedy. Where to eat near the 9/11 museum? 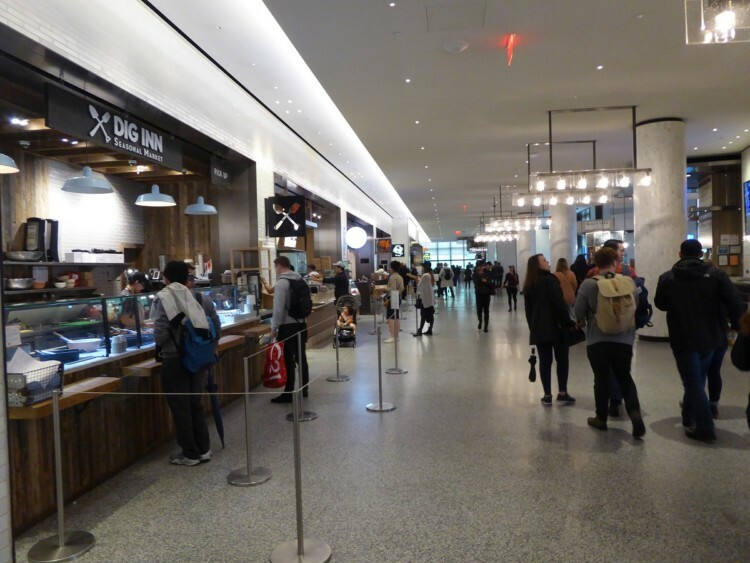 A good, kid-friendly place to eat near the 9/11 Museum is the upscale new food hall, Hudson Eats. It’s in the fancy Brookfield Place Mall across the street. The food hall has lots of healthy, fresh and ethnic choices, plus pizza and tacos for the kids. You can sit along giant windows overlooking the Hudson River, and if you walk outside near the waterfront, you’ll can see the Statue of Liberty in the distance. 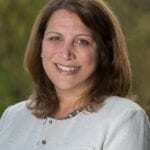 Vegetarian TravelingMom Judy Antell recommended Hudson Eats, too, in her excellent 2-day New York City itinerary story. While it’s a cab ride away, at 842 Broadway, a mood-boosting treat might be found at Max Brenner Chocolate Bar, a sit-down restaurant with an enormous chocolate-themed menu. Read my review of the place here. What else is near the 9/11 Museum? Get a view of New York City from the 102nd floor of the new World Trade Center Observatory across the street. 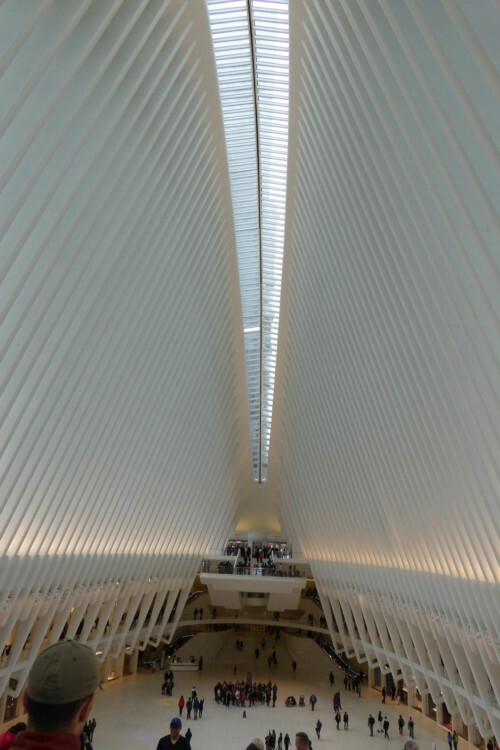 The architecturally stunning Oculus World Trade Center transportation center and mall that’s worth a quick look. The museum is also near the ferry dock for trips to the Statue of Liberty and Ellis Island. Where is the 9/11 Museum? In lower Manhattan, at 180 Greenwich Street. Is the 9/11 Museum free? No. The 9/11 memorial fountains are free, but the museum tickets start at $24 for adults and $15 for kids. Tickets need to be purchased in advance, and you are given a specific time you can enter. How long does the 9/11 museum take? Plan on a minimum of two hours, probably closer to three hours. What are the 9/11 museum hours? The museum is open daily, from 9 a.m. to 8 p.m. Sun-Thurs, and from 9 a.m. to 9 p.m. Fridays and Saturdays.